Farm Credit of Central Florida Chairman of the Board, David J. Stanford, a Winter Garden citrus grower, announced the association’s eligible member/borrowers will benefit from patronage refunds, or profit-sharing, of $3.5 Million, significantly lowering their cost of borrowing. Farm Credit of Central Florida is a member-owned cooperative lending funds to ranchers, growers, farmers, and rural homeowners since 1917. Eligible members will receive their patronage refund 100 percent in cash. 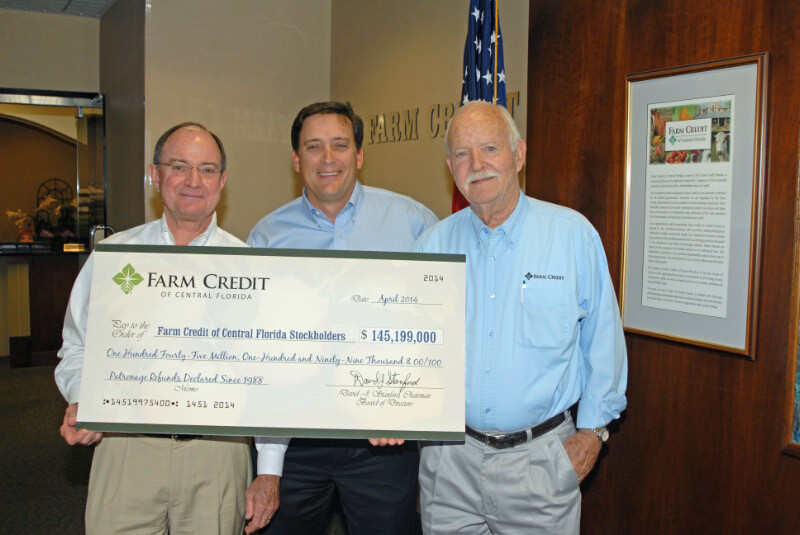 Photo Caption: Farm Credit of Central Florida Directors, John Langford, Keith Mixon, and Lewis Stidham hold an oversized check symbolizing the $145 million+ in patronage refunds the board of directors has declared since 1988. The patronage refund can significantly lower a member/borrower’s cost of funds. “The patronage refund is a reward to our members for their loyalty and is proof positive of our adherence to cooperative principles. The patronage refund is a critical component of the Farm Credit Advantage,” Stanford said. “This strong patronage refund continues the tradition of putting our profits in our members’ pockets. I am pleased to report 100 percent of this patronage refund will be paid in cash and represents a return of over 16 percent of earned interest. The resilience and perseverance of our Farm Credit members through one of the most devastating depressions since the 1930s has helped our association to grow and prosper,” said Reggie Holt, Farm Credit of Central Florida president and CEO. Since 1988, Farm Credit of Central Florida’s board of directors has declared patronage refunds exceeding $145 million. The coop’s service area spans from the Gulf of Mexico to the Atlantic coast serving 13 Central Florida counties including, Citrus, Hernando, Pasco, Sumter, Hillsborough, Pinellas, Polk, Lake, Orange, Osceola, Seminole, Volusia, and Brevard. For perspective, the $145 Million would pay the entire Tampa Bay Rays team payroll for two and a half seasons, buy 2,400 John Deere Model 613D tractors, or 15 Lear Jets! Stretched end to end, 145 million dollars would stretch from Lakeland, Florida to Los Angeles, California almost six times, or halfway around the globe at the equator!